If you follow me on Instagram, you'll know that I recently finished organizing the 2017 Gourmandise Grain Conference in Santa Monica a couple weeks ago. Through that experience, I was invigorated to get on the whole grain train and develop a recipe that I can use time and time again to help spread the word of how AMAZING whole grain baked goods are! I'm not an expert baker whatsoever but I love experimenting! If you have been baking for a few years or even a beginner, start getting into whole grains if they are accessible to you! Consider getting flour from local LA miller Nan Kohler who owns Grist & Toll or contact the Tehachapi Grain Project and any number of other California farmers who are growing their own heritage heirloom grains. More often than not, the flour ingredient is seen as a white canvas when you're baking and I learned how to infuse flavors with the additional elements like fruit, infused creams or chocolate. BUT the game changer is when your flour complements your other flavors... almost like how a glass of wine can bring out amazing depth to the steak you're eating. 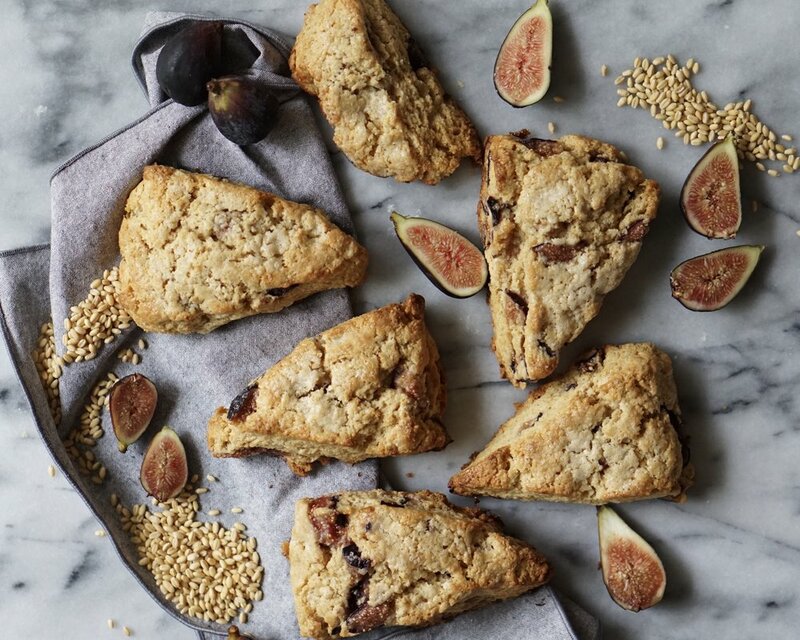 I came up with these whole grain scones because baking with whole grains doesn't have to be scary! It can actually result in the most delicious scones ever. So I've been told. ;) Keep in mind you will need to let your dough rest a bit more than traditional flour and the main difference is in hydration. Try this out with your whole grain flour and let me know what you think! My recipe featured a beautiful Sonora whole grain flour from Tehachapi Grain Project. 1. Prepare the figs by dicing them into 1/2 inch pieces. I cut mine in half, then quarters, then sliced each quarter into 2-3 pieces depending on how big they were. Lay all the diced fruit on a piece of parchment paper on a single layer and stick them into the freezer. Want the fruit to be frozen so they don't get smashed when you mix them into the dough later. 2. Prepare another sheet pan with parchment paper and set aside. This will eventually hold your cut scones. In a large mixing bowl, add your flour, sugar, baking powder, baking soda, lemon zest and salt. Whisk together to incorporate your dries. 3. Add butter to your flour mixture and start to cut your butter chunks into the flour. I like to do this method with my fingers so I can control the size of the butter chunks. Alternate between tossing everything together then press the butter and flour together. Work quickly and stop pressing the butter into the flour when they become pea sized. The mixture should look mealy and chunky. 4. Add half of the buttermilk amount and toss around in the flour to incorporate. Remove frozen figs from the freezer and add into the flour butter mixture, then add the rest of the buttermilk. Continue to mix with a spoon or your hands (if you don't care about getting messy). If the mixture feels too dry and not holding together, add another tablespoon of buttermilk. 5. Lightly dust your tabletop with flour and dump out the dough on your surface. This is where you want to be careful with NOT overworking your dough or you'll end up with tough scones. 6. We're now going to incorporate some folds into your dough. Two folds to be exact. Pat down your dough to a rectangle that is about an inch thick. Fold the dough rectangle in half on top of itself and using the heel of your palm, press the dough down back into a rectangle that is an inch thick. Repeat the fold on the opposite end and press down with your palms until the dough is about 2 inches thick. Keep in mind you'll want the shape of the final dough to be a long rectangle so work toward that as you're incorporating your folds. 7. Using a large kitchen knife, cut triangles out of your long rectangle and transfer on to your lined sheet pan. Cover in plastic wrap and freeze overnight or at least 2 hours. 8. When ready to bake, preheat oven to 400F. Make your scone cream wash by adding a pinch of salt to your heavy cream. 9. Add scones to a new parchment lined sheet pan and brush only the TOPS with your heavy cream and sprinkle with more granulated sugar. 10. Bake for 25-30 minutes or until the scones are lightly browned on top and develop a darker crispy bottom. 11. Enjoy fresh out of the oven! When I was deciding what desserts to make for my final showstopper, I knew it was one of those go big or go home type of moments. I've made macaron a few times over the course of my baking days and I gotta say I've definitely had more disasters than successes! So WHHHYY did I choose this? I believed that if I could nail one of the most difficult desserts while baking under stress and in a TENT, that it would really prove to myself that I really do deserve to win that title. Being Chinese American, I grew up eating black sesame desserts! My favorite are Tang Yuan, which are rice balls with black sesame filling that you eat in a rice wine soup and these are typically eaten over Chinese New Year. Whenever I eat these I think of my family so it was an obvious pick to make macaron with black sesame where I could use the powder to flavor the shells. Black sesame is also one of those amazing flavors that pairs well with subtle sweet flavors that can play off it's earthiness and complexity. I always wanted to bake with champagne so made a buttercream filling that has the light, sweetness of honey but something tart to balance it being the champagne. This macaron recipe is a bit more forgiving because it's using an Italian meringue method vs French meringue. That means you're creating a sugar syrup for the whipped egg whites vs adding in granulated sugar directly to the egg whites. I knew this was my only chance of nailing it in an environment that could have been high humidity and uncontrollable.